Manage your entire business from your pocket with AND CO.
AND CO's combination of smart technology and real human expertise works to create simple, clean invoices, manage projects and track expenses. - Smarter invoicing: Create invoices in 20 seconds or less, track payments, and send reminders so you can get paid on time, every time. 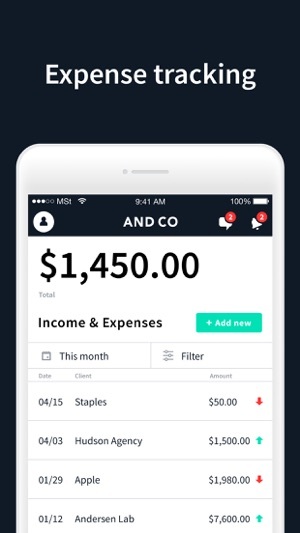 - Automated expense-tracking: Connect your bank account to automatically track expenses. - Simplify tax prep with clean, detailed income statements. - Ridiculously easy payments: We provide one simple page to accept payments quickly and easily from credit cards, bank transfers, or PayPal. - BONUS! A personal Chief Operator (real human, none of this chatbot nonsense) to help with your business. - Sometimes you might have received a notification saying the timer was running when in reality it was not. We've adjusted the honesty level of the app to stop this lie. - It was not possible to delete an income. Hopefully not many users need this feature. - When resending an invoice, the preview looked distorted. - Reconciling entries didn't work for some users. - When tracking time on an already existing activity, sometimes the information was not filled out correctly. If you use this app with serious clients they will laugh at you. So this service looks really nice and they have an incredibly friendly persona built around the brand which looks very human. Disclaimer I'm a customer of and co and harvest. However the product is not function at all in the slightest. The timesheet capability is subpar and lacking as compared to other fantastic and more seasoned solutions like harvest.i've been using this product for about six months and paid upfront for the upgraded plan. 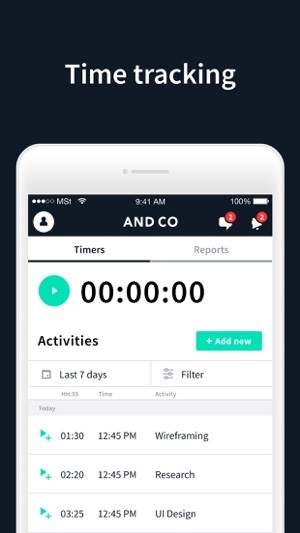 Do not use the contracts future in this app it will not work 10 out of 10 times and if you send a contract to a client from the mobile app they will get an email notification and then waste that person's time. The contractor not even show up under your projects as drafts and your client will be sent to a blank page. The time tracking capability is confusing at best these guys think they know a thing about product design but they have not figured out how to mimic what other companies have been doing for years. I would suggest using Harvest if you want to do time tracking. The import transactions feature does not work and it is unclear whether that will ever be resolved. Hey There! Thank you so much for taking the time to reach out and let us know your thoughts. We sincerely appreciate it and we’re super disappointed to hear you haven’t had the best experience so far. Your entire Chief Operator team is here for you and we want to do everything we can to make you as happy and comfortable with the app as possible. If it’s allright with you we would love to reach out and go over some of your points and listen to how we can really make AND CO as awesome as possible for you. So before I started using AND CO, I thought the idea sounded cool. But I didn't see it as something I HAD to have. Well, I was wrong. The invoicing, the time tracking, the instant pay options for clients & so much more — it's fantastic! Instead of recreating invoices or using a bunch of random apps, it's all here in one place. My business looks legit, and thanks to AND CO I really am legit!! Plus, they're so nice and responsive! They're always acknowledging the community's feedback and asking us what can be better. This is not just a fancy website and a pretty app. If you work for yourself, this is a no-brainer. You won't think you need it, but you do. Go ahead. Download it. What are you still doing here? Just go download it already. I just tried to use this for my most recent freelance project because I heard good things, and I quickly discovered that it’s barely functional. My changes when editing the contract never save. I edited the “client” because someone else wanted to sign, previewed it to make sure it was correct, sent the contract to the correct person, only to find that their name still wasn’t included on the contract that was sent to them. The original incorrect name was still there. I have been fighting with it for hours tonight - there have been several other errors and issues, and I will most likely never use this again unless it magically functions better tomorrow. I hope I can save face. I’m extremely embarrassed from the back and forth chaos with my client. I should’ve known better than to risk sending the contract through this service since it was giving me so much trouble from the get-go. I’m glad it didn’t cost me any money at least! Hey Maddie! Thank you so much for bringing this up. While we dont have any known issues about this we would love to know more and do everything we can to help get you all set. Your Chief Operators are standing by to help get you comfortable with the app and please feel free to chat with us anytime in the app or by emailing us at hello@andco.nyc anytime! © AND CO Ventures Inc.